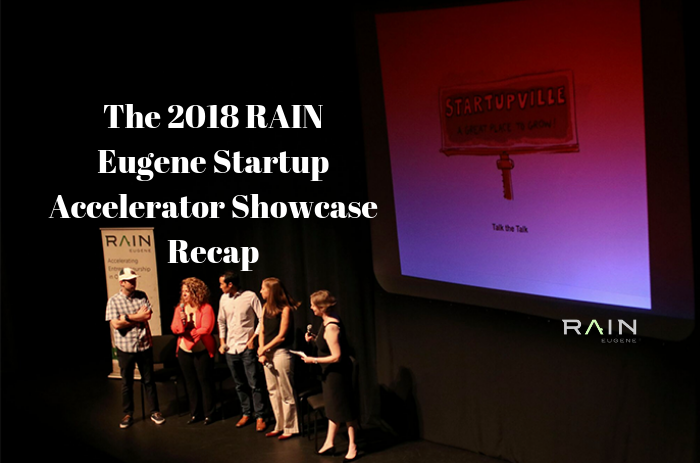 On October 3rd, the Hult Center’s Soreng Theater filled with people eager to hear updates from past RAIN Eugene business accelerator cohort graduates and pitches from the newest cohort graduates. Todd Edman, Co-founder of Bitcork, talks about the startup ecosystem in Eugene and the rest of Lane County. and spoke about the importance of entrepreneurs and how much small businesses and startups contribute to the economy. All jobs created since 1984 come from companies that are zero to five years old, he said. These companies represent everything that keeps the economy moving in a capitalistic society— farms, retail shops, food, clothing, and technology. There are barriers for many people who would enter the entrepreneurial ecosystem, and Edman reinforced that everyone should feel a sense of duty to work to lower those barriers whenever they can. The secret to increasing startup density, he said, is creating a healthy environment where startups can flourish. Part of the way that people can do this is by attending entrepreneurial events, providing mentoring and being inclusive—in other words, creating a healthy “soil” in which an entrepreneurial “garden” can flourish. Edman introduced Anne Fifield, Economic Planning Manager for the city of Eugene, who led the panel discussion with four Eugene RAIN graduates. Lauren Jerome, founder of MindBox Studios, finished RAIN Eugene’s accelerator two years ago. Chris Lee, founder of Concierge365, completed the accelerator in 2017. Elaine Pandolfi created Ink Defense Tattoo Care after completing the program in 2017. And Spencer Holton, the youngest of the four panelists, founded Trail Supply Co. while a sophomore at the University of Oregon as part of cohort four in 2016. Pandolfi had a coworker who referred her to Eugene RAIN’s Joe Maruschak. She signed up for mentoring events, started mentoring with FertiLab and became involved in the community by co-founding Redefining Women in Tech with Lauren Jerome. Eventually, she gained the confidence and the skills to transform her hobby of making cosmetic creams into an actual business. Lee had a company he said was “dying on the vine” when he first discovered the local business incubators. “I had a business but didn’t know anything about business,” he said. “I was technically proficient and could learn well but there are a lot of things in business that you don’t get until you fail or experience failure yourself and then you succeed.” He experienced the satisfaction of being a part of a group and learning from others. After that panel discussion, the seven members of current cohort six began delivering their business pitches. Each person had eight minutes in which to deliver their pitch with no prompts or accompaniments other than their slides. Following the showcase, the audience was invited to a reception where the presenters had tables and were open to further discussions about their businesses. Olmstead is infiltrating the robotics industry with his development of vision-guided robots that are as fast as blind robots. He’s developing a line of 2D and 3D robotic cameras as well as vision-guided robotic systems to help with tasks such as automated packaging. He’s planning an early 2019 product launch. Wolfe is a working musician who plans to disrupt the music licensing industry with his development of an app that eliminates the need for performing rights organizations (PROs) who charge high licensing fees for the performance of live music. He plans to allow performers to enter their gig data and playlists directly into the app, which collects licensing fees on a per-song basis. Because it eliminates the need for venues to pay high licensing fees on a yearly basis, with his app gigs can happen anywhere, at any time. Tom’s biotechnology company is developing a contrast agent that can be used as a molecular probe to analyze and diagnose diseases. She plans to use oxidized proteins and color for a disease-identifying chemical switch that surpasses current abilities to fingerprint different diseases. She is working on patents and publications and within nine months will be bringing in revenue. Within a year she plans to obtain a major research grant. Ackerman struggled to connect with tutors as a student, and he knew that tutors struggled to connect with students who needed their services. Scheduling and payments were difficult, so his app aims to easily allow students to find local tutors for face-to-face meetups, remind both tutors and students of their appointments and seamlessly accept payments. He’s on track to meet his goal of booking 1,000 tutoring appointments at the University of Oregon during fall term 2018. Castonguay’s spectral diagnostic imaging can be used in many ways, from luggage scanning to pesticide testing. The problem with the current analysis, particularly for field surveys, is that the sample must be collected, cataloged and tested, then it’s a waiting game until the results come back. Whereas most competitors do only point analysis, his device allows for the scanning of multiple substances, in the field over large areas. It’s faster than current methods because it automatically connects to an online database of results. After developing Sohr, a hazelnut-based protein drink, Jaraczewski is taking the idea a step farther by developing a company dedicated to using Oregon’s abundant hazelnut crop for a new entry into the fresh nut milk market. He’s planning January 2019 market trials of his hazelnut milk followed by a June 2020 California launch. LedgeCTRL is a software configuration and deployment tool for blockchain applications. Many people know blockchain as a part of the Bitcoin industry, but it has applications beyond that in proving authenticity and existence as well as ownership of digital and physical assets. Using the CTRL API, any developer, even one without advanced knowledge of blockchain, can integrate blockchain applications into existing systems. Page, a certified Pilates instructor, hopes to redefine women’s fitness by allowing women to quickly and easily schedule one-on-one or group sessions with a certified fitness instructor over Skype. She wants to eliminate the need for women to work out in embarrassing public situations or in uncomfortable places or needing to leave their family at home just so they can get in a workout. Her platform seeks to bring a convenient, flexible and affordable alternative to online fitness. Men are welcome to use it too.